How do I supply power through the GPIO? I have seen some examples of people powering their Raspberry Pis by wiring a DC "barrel plug" style power supply to the 5V and GND GPIO pins. What considerations should be taken when doing something like this? Do I need to add any protective components or will any decent 5V power supply with a high enough current be fine for long term use and not destroy my Raspberry Pi? 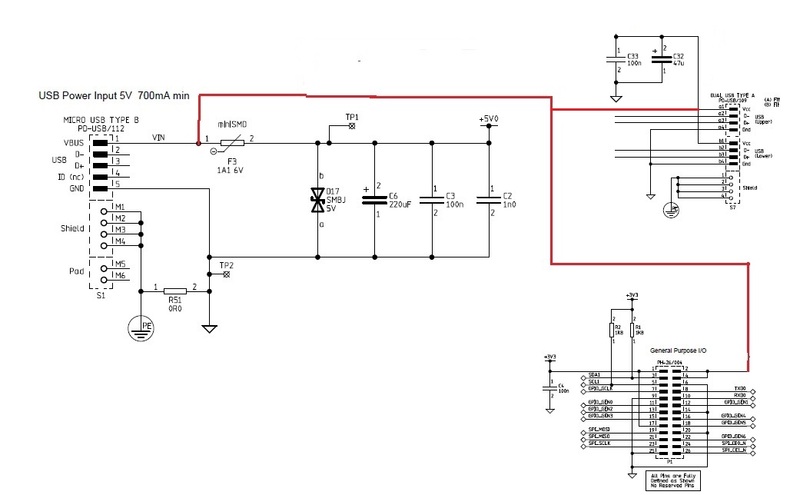 I have copied part of the input schematic on the USB power. In this sub section the +5v supplied from the USB connector is filtered to give a nice stable 5v supply to the 5V0 Rail. 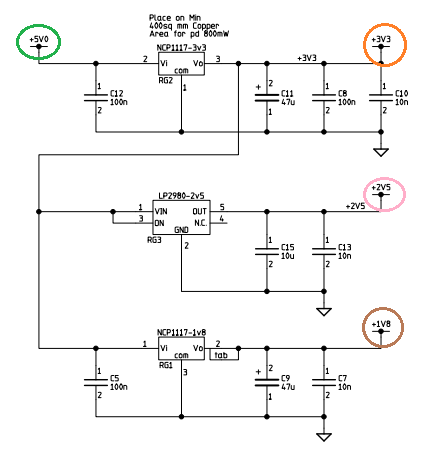 By studying the schematic you come to realise there are 3 more voltages (4 in total) used on the Pi. This sub circuit which is connected to the 5V0 rail has 3 voltage regulators with their own filter capacitors. To answer your question. Yes you can supply 5v on the GPIO pin. BUT, it has no backward protection and it was not really designed to be a 5volt input pin. the 3.3v pin can also be powered with 3.3v as the regulator has build in protection- but again it leaves your BCM unprotected! Typically any power pins on GPIO area are used to power extended circuits. You need to realise that the USB schematic was carefully designed to be used as the primary +5V input and protects the Pi from getting fried. The GPIO pin does not offer this protection fully and you really need to trust your power supply if you want to do that! Usually people make another high powered PCB to drive other things. For example an H-Bridge used to drive motors for a robot. All it needs is TTL signals to control the motors but it runs of its own power supply; and most of the time it supplies power to the MCU/CPU via its own protective circuits isolating it from the high power circuit. First of all, using 5V GPIO pin you are bypassing input fuse that is on the RPi. This means you have no protection in case you make some short cut etc. So if you do, a lot of current (depending on how much you power supply can supply) can flow through your Pi and can damage it. You are also bypassing TVS diode so you are basically without any protection. Also remember that you have to put regulated 5V to this pin. Most power adapters won't output regulated voltage (unless stated otherwise on them) so you would also need to use some voltage regulator circuit. And last thing is that there is some smoothing capacitors that makes power more stable so it would be wise to connect some capacitors yourself. Connecting a barrel connector to the 5V and GND pins will be fine, but be wary you won't have the protection of the input fuse - such is life. Ensure you use a properly regulated 1A@5V PSU ideally with overcurrent protection; unregulated PSUs are useless! Yes you can. If you use battery ,and not dc power supply is very safe as in my catspberry 2 progect. the fuse f3 protect only nvcp11117-3v3 and some resistence near hdmi. nvcp11117-3v3 Output Current Limit is typically 1A and max 1.5A and f3 fuse give max power of 1.1A. 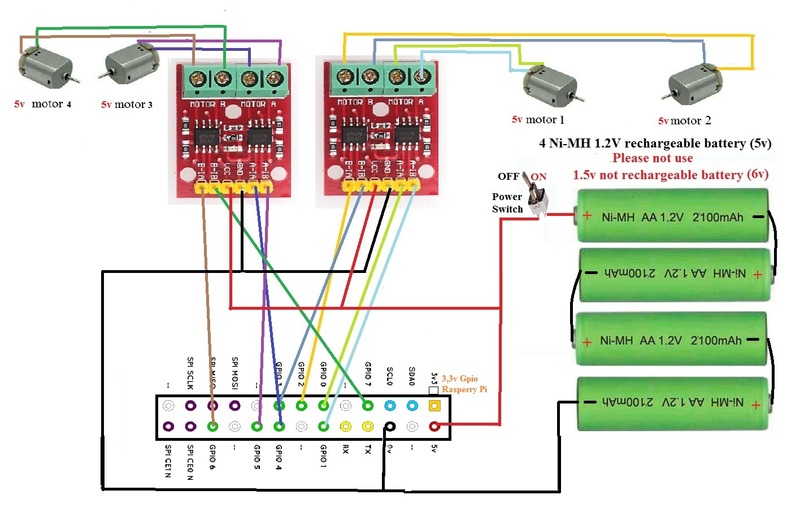 Even if you use a dc power supply, connected to gpio, is very unlikely burn the nvcp1117-3v3 but you can use any kind of usb device. If you use microusb power connector ,to give power to raspberry pi, you can not use many usb device because there is not enough power. A good idea was make some modification to rasperry pi to give +5v directly from "microusb power connector" to usb and gpio ,without pass through 5v+ bus,like thise . I designed a small board to provide power, mount an Adafruit ultimate GPS breakout and a Hall sensor input/pull up resistor. (Purpose is Open Road Racing). I used a Dimension Engineering 7805 size switching regulator and output capacitor. Works just fine and stays at exactly 4.98V. Use good parts and this should be fine. You can use the 4 NiMh batteries - but I would always check that the voltage is 5v or within .25v of that. 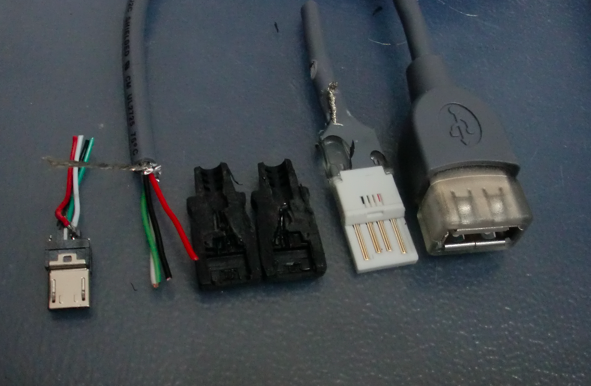 Also I used a Nokia mobile phone USB connector connected to a USB socket from a broken, cheap hub (from a pounshop originally so only £1) with only the 2 outer lines soldered to wires going to the battery pack. Simple Fix, Soldier to the side of the fuse that goes to the USB connector to your +5v in line, and your gnd to tp2 or the side of the capacitor that goes to gnd. Then your still using the fuse. If it is more power you need, then your left with jumping the fuse. I'm dealing with the same issue putting an RPi on my Helicopter. Space is a concern so a modded power jack is out of the question. Ive made a 5v 50A (drastically over powered (no heat)) regulator so i can run 12v battery instead of the 5v that is in it. Not the answer you're looking for? Browse other questions tagged gpio power-supply or ask your own question. What GPIO pins are required to Power RPi? Is it possible to have 5V output from a GPIO pin? Can i use 2.5Amp on Raspberrypi 3B GPIO 5v pins? Can I connect a 16x2 LCD screen to the 5V GPIO? How much power can the Pi supply? 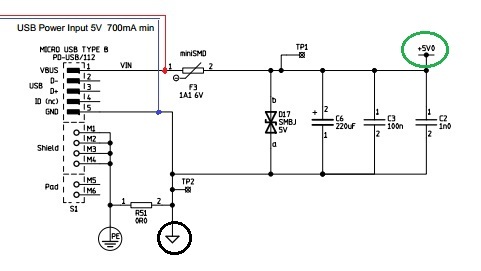 What's the maximum safe power supply voltage through GPIO? GPIO output working, but not? How can I connect a raspberry pi (or even multiple ones) to a molex 4 pins?